The tea shot-hole borer, Euwallacea fornicatus (Eichhoff) (Coleoptera: Curculionidae: Scolytinae) is an Asian ambrosia beetle introduced to Florida, in the early 2000s (CABI 2003). In Florida it does not have any known economic impact, but it is a serious pest of tea (Camellia sinensis (L.) Kuntze) around the world. This species is one of the few ambrosia beetles that can infest healthy plants. It has been recorded from more than 48 plant families (Danthanarayana 1968). Occurrence of the shot-hole borer in tea is reported from India, Sri Lanka, Indonesia, Malaysia, China, The Philippines, New Guinea, Vanuatu, Fiji, and Hawaii (James 2007). The population in Florida has not caused any damage to local trees, but populations currently classified as the same species have been introduced into California and Israel, where they are causing extensive damage to avocado and other commercial, urban and natural vegetation (Eskalen et al. 2013, Mendel et al. 2012). It is likely that these destructive, genetically distinct populations constitute a separate species, closely related to the tea shot-hole borer. Figure 1. Adult Euwallacea fornicatus (Eichhoff). A-B female, C-D male. Photographs A and B by Jiri Hulcr, University of Florida; C and D by You Li, University of Florida. The tea shot hole borer belongs to the tribe Xyleborini, a group comprised entirely of ambrosia beetles that are engaged in symbiotic relationships with ambrosia fungi. In the case of Euwallacea fornicatus, the symbiotic fungus is Fusarium ambrosium (Gadd & Loos) (O’Donnell et al. in press). Adult beetles carry the fungal spores in mycangia, which are special organs located in the oral cavity of the head. This fungus is not only a nutritional symbiont of the beetle, but also a weak plant pathogen, possibly facilitating colonization of twigs and branches. Euwallacea is a genus of over 40 species within the largest tribe of scolytine beetles, the Xyleborini, which contains nearly 1200 described species (Hulcr et al. 2015). The tea shot-hole borer was first described by Eichhoff in 1868 and originally classified in the genus Xyleborus. A very closely related species, the polyphagous shot hole borer (Euwallacea n. sp. ), is a similar species originally from Asia which is now invasive in California and Israel. It is morphologically indistinguishable from the tea shot-hole borer, and as such was initially recorded as Euwallacea fornicatus. This putatively new Euwallacea species has different symbionts and has caused much greater damage in its introduced range (Brayford 1987, Eskalen et al. 2013, Mendel et al. 2012, O’Donnell et al. in press). Several other species or populations look very similar to Euwallacea fornicatus. Euwallacea fornicatus is native to southeastern Asia and has been accidentally introduced to many countries throughout the world. Euwallacea fornicatus is reported as a pest of tea in several places in Africa, Australia, Bangladesh, China, Cambodia, India, Indonesia, Japan, Laos, Madagascar, Malaysia, Myanmar, Pacific Islands (Caroline Islands, Fiji, New Guinea, Hawaii, Vanuatu, Solomon Islands), The Philippines, Sri Lanka and Vietnam (CABI 1973, James 2007). It gained the status of a major pest of tea in Sri Lanka and southern India, and recently became a major pest of Trident maple (Acer buergerianum Miq.) in southwestern China (Li et al. 2014). This species is also distributed in the New World, most likely introduced through commerce. The first record is from 1979 from a small tree branch in the Canal Zone, Panama (Wood 1980). Adult females: Adult females are 1.9-2.5 mm long, 2.3 times as long as wide. They are black or nearly black, but recently eclosed adults may be brown. The pronotum is as long as wide, rounded in front, with parallel sides. The frontal edge of the pronotum bears a row of saw-like projections; the surface of the frontal slope of the pronotum bears similar projections, but here they are scattered. The elytra are 1.3 times as long as wide, 1.3 times as long as the pronotum. There are no conspicuous surface features present on elytra with the exception of rows of punctures (striae). The hairs (setae) on the elytra are erect and organized in rows. Adult males: Males are noticeably smaller, 1.5 mm, 2.0 times as long as wide. Their elytra are fused, eyes are minute, and wings are atrophied and non-functional. Eggs: Eggs are off-white, partly translucent, approximately 0.3 mm long. Eggs hatch in four to six days. Fertilized, diploid eggs (those with both maternal and paternal genetic information) hatch into females, while the unfertilized, haploid eggs (those with only maternal genetic information) hatch into males. There is usually only a single male egg per family. Larvae: Larvae are typical weevil larvae: white, C-shaped, legless, with an orange head capsule. Tea shot-hole borer larvae have three instars, as almost all weevils do. The larvae feed entirely on the symbiotic ambrosia fungus. The larval stage is complete in 16-18 days and the third-instar larvae reach about 3.0 mm in length. Pupae: Pupae are white, the same size as adult beetles. The haploid pupa of the male is distinctly smaller than the pupa of the female. Pupation takes place inside the same communal gallery as larval development. Adults emerge within seven to nine days (Kumar et al. 2011, James 2007). There are two other Euwallacea species in the southeastern US: Euwallacea validus and Euwallacea interjectus (Atkinson 2014, O’Donnell et al. in press). Compared to these two species, Euwallacea fornicatus is much smaller (1. 9-2.5 mm compared to 4-5 mm) and has a more strongly curved pronotum and a more truncate abdomen (the elytral length/width ratio is smaller). Records of Euwallacea validus from Florida are dubious and probably resulted from misidentifications of Euwallacea interjectus (Cognato et al. 2015). To distinguish the genus Euwallacea from other ambrosia beetles, please refer to A guide to Florida’s common bark and ambrosia beetles. The newly eclosed female leaves the parental gallery and establishes her own gallery in a new host plant. Almost all females are fertilized by the less numerous males, usually their brothers, in the parental gallery. The life cycle time and body length varies with different host plants and temperatures (Muraleedharan 1991). When the new females leave the parental gallery, they carry inoculum of the fungal symbiont in specialized oral cavities called mycangia. This fungus, the highly coevolved symbiont Fusarium ambrosium, is an essential source of food for the beetles, and is slightly pathogenic for the host tree tissue. Figure 2. 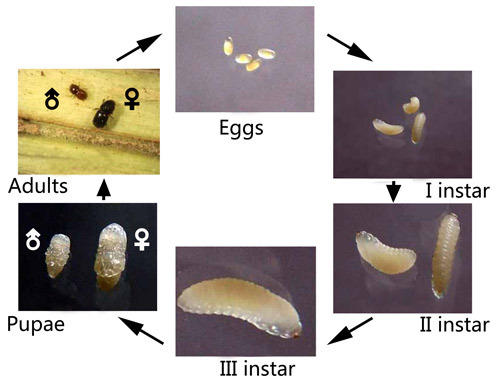 Life cycle of the tea shot-hole borer Euwallacea fornicatus (Eichhoff). Photographs and graphics by Sachin P. James, Department of Zoology, Malabar Christian College, India. Euwallacea fornicatus is capable of breeding in a wide variety of live hosts. It is also known as a destructive pest of several economically important woody plants, including tea (Camellia sinensis, Theaceae), avocado (Persea americana, Lauraceae), citrus (Citrus spp., Rutaceae) and cacao (Theobroma cacao, Malvaceae). Plants in at least 48 other families have been reported as occasional hosts, including Anacardiaceae, Burseraceae, Fabaceae, Moraceae, and Salicaceae (Danthanarayana 1968). Figure 3. Euwallacea fornicatus (Eichhoff) attacking the stems of trident maple, Acer buergerianum in China. Photograph by Qiao Li, Key Laboratory of Forest Disaster Warning and Control, Southwest Forestry University, Kunming, China. In Florida, no Euwallacea fornicatus damage has been reported. In its native region, the tea shot-hole borer is pestiferous in tea plantations, and control has been difficult. The species causes two types of injury. The primary injury is caused during the construction of galleries in tea stems and branches, which results in branch breakages and occasionally dieback of the whole tree (Brayford 1987). The secondary injury occurs from wood rot, leading to debilitation of the tea plant (Walgama 2012). Outside of tea plantations, Euwallacea fornicatus and its symbiont fungi are not known to harm naturally growing live trees, and instead breed in dead and dying branches. 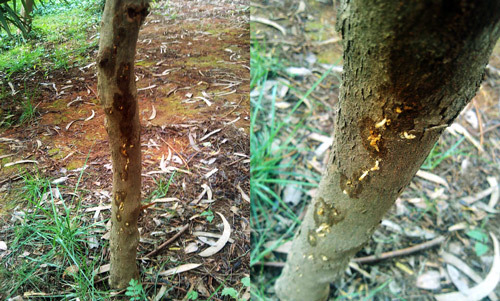 However, the effect of this species and its fungi on naïve trees in different ecosystems is unknown. Two closely related lineages are now established in Israel and California and are causing considerable damage to many tree species. Therefore, the entire species complex of Euwallacea fornicatus is potentially a phytosanitary threat. The European Plant Protection organization has added the species to its Alert List. In Florida, Euwallacea fornicatus is still rare and of no known economic consequence, thus control measures are not needed at this time. In tea plantations in Sri Lanka and India, pruning and destruction of infested plants is the recommended cultural practice. Chemical control may be considered, but use of certain pesticides leads to the loss of organic status of tea, which may result in considerable monetary losses. Biological control and resistance breeding may be the most environmentally friendly and economically feasible methods, but only few attempts have been reported (Walgama 2012). In California, where the closely related species polyphagous shot-hole borer is causing damage, many different management options have been tested; readers can refer to publications produced for this species in California. It is important to prevent further spread of this damaging species, including its spread to the southeastern US, therefore the importation of any untreated wood from California is discouraged. Atkinson TH. (2014). Bark beetles of North and Central America. (22 November 2014). Brayford D. 1987. Fusarium bugnicourtii sp. nov., and its relationship to F. tumidum and F. tumidum var. coeruleum. Transactions of the British Mycological Society 89: 347-351. CABI. (2003) Euwallacea fornicatus (Eichhoff, 1868). Crop Protection Compendium. (10 March 2015). CABI. 1973. Distribution Maps of Plant Pests, Xyleborus fomicatus. Map 319. CAB International, Nosworthy Way, Wallingford, Oxfordshire, Oxio 8de, UK. Cognato A, Hoebeke ED, Kajimura H, Smith SM. 2015. History of the exotic ambrosia beetles Euwallacea interjectus and Euwallacea validus (Coleoptera: Curculionidae: Xyleborini) in the United States. Journal of Economic Entomology, in press. Danthanarayana W. 1968. The distribution and host range of the shot-hole borer (Xyleborus fornicatus Eichh.). Tea Quarterly. 39: 61-69. Eskalen A, Stouthamer R, Lynch SC, Rugman-Jones PF, Twizeyimana M, Gonzalez A, Thibault T. 2013. Host range of Fusarium dieback and its ambrosia beetle (Coleoptera: Scolytinae) vector in southern California. Plant Disease 97: 938-951. Hulcr J, Atkinson TH, Cognato A, Jordal B, McKenna D. 2015. Morphology, taxonomy and phylogenetics of bark beetles. In: Bark Beetles (F. Vega & R. Hofstetter, eds.). Elsevier, pp. 41-84. James SP. 2007. Studies on certain plant volatiles attracting the shot hole borer, Euwallacea fornicatus (Eichhoff) (Scolytidae: Coleoptera) infesting tea. Bharathiar University. 126 pp. Li Q, Zhang G, Guo H, He L, Liu B. 2014. Euwallacea fornicatus, an important pest insect attacking Acer buergerianum. Forest Pest and Disease 33: 25-27. Mendel Z, Protasov A, Sharon M, Zveibil A, Yehuda SB, O’Donnell K, Rabaglia R, Wysoki M, Freeman S. 2012. An Asian ambrosia beetle Euwallacea fornicatus and its novel symbiotic fungus Fusarium sp. pose a serious threat to the Israeli avocado industry. Phytoparasitica 40: 235-238. Muraleedharan N. 1991. Pest management in tea: p.69. The United Planters Association of southern India, Tea Research Institute, Valparai 642 127, Coimbatore Dist. India. 130 pp. Kumar R, Rajkhowa G, Sankar M, Rajan RK. 2011. A new host plant for the shot-hole borer, Euwallacea fornicatus (Eichhoff) (Coleoptera: Scolytidae) from India. Acta Entomologica Sinica 54: 734-738. O’Donnell K, Sink S, Libeskind-Hadas R, Hulcr J, Kasson MT, Ploetz RC, Konkol JL et al. 2015. Discordant phylogenies suggest repeated host shifts in the Fusarium-Euwallacea ambrosia beetle mutualism. Fungal Genetics and Biology. DOI: http://dx.doi.org/10.1016/j.fgb.2014.10.014. Walgama RS. 2012. Ecology and Integrated Pest Management of Xyleborus fornicatus (Coleoptera: Scolytidae) in Sri Lanka. Journal of Integrated Pest Management 3: A1-A8. Wood SL. 1980. 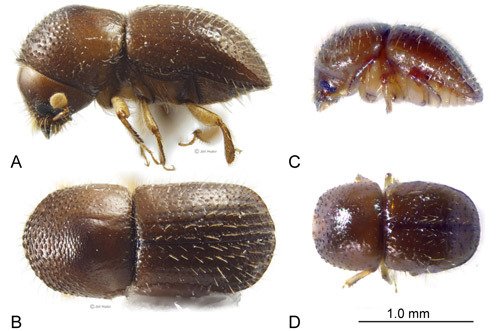 New American bark beetles (Coleoptera: Scolytidae), with two recently introduced species. Western North American Naturalist 40: 353-358. Photographs: Jiri Hulcr, You Li, University of Florida, Sachin P. James, P.G & Research Department of Zoology, Malabar Christian College, India, Qiao Li, Key Laboratory of Forest Disaster Warning and Control, Southwest Forestry University, Kunming, China. Publication Date: April 2015. Reviewed February 2018.